on all the lines that begin with mirrorlist and baseurl change the 5.2 to be just 5. Here's the resulting sipxecs.repo file. Published a new whitepaper on dealing with DNS and sipXecs. Let me know if there are any glaring problems. I'll likely add other scenarios as time goes along. If you have a specific need please let me know. Somebody questioned how I was handling DNS inside and outside my network so I figured I'd document what I'm doing for remote users and Internet dialing. I have the following setup at home right now. This same configuration would apply for a small business that doesn't have static IP's (I'm sure you could cherry pick info here if you do have static IP's too). I'm on a DSL connection at home with a non-static IP. Modified sipxecs.info.zone file and replaced all references to 'xyzcompany.com' with 'sipxecs.info'. Edit /etc/named.conf and duplicated info from xyzcompany.com domain for new sipxecs.info domain. Restart DNS and make sure you can ping / dig new domain. Add alias to domain (Domain is under System menu) for sipxecs.info. Restart all services that request restart. Add the SIP Trunking services to the SIP Server (Click on server in System->Servers). Enable Internet Dialing and set your internal IP range (under System menu), set the SBC to be sipXbridge-1. Added *.sipxecs.info as an Intranet Domain. Enable NAT Traversal and let sipXecs know it is behind a NAT (Click on Internet Calling in System then NAT is on LEFT menu). Determine where you are pointing for DNS. If you are pointing at the PBX machine then no worries. If you are pointing at some other DNS server you'll need to figure out how to get that machine to point to the PBX to resolve your domain (in my case all resolves for the sipxecs.info domain can be redirected by pfSense to the PBX and I point to pfSense for my DNS server). For the following NAT entries, allow pfSense to also create the required firewall rules. Add NAT entry for External IP port 5060 udp to sipXecs internal IP port 5060 udp. Add NAT entry for External IP port 5080 udp to sipXecs internal IP port 5080 udp. (only needed if you do SIP Trunks). Add NAT entry for External IP port range 30000-31000 udp to sipXecs internal IP port range starting at 30000. Allows my roaming users and other users on the internet to find my sipXecs server via an external IP address that is forwarded in to my PBX. Allows my internal users to find my sipXecs via an internal IP address. Allows anybody on the internet to reach me at myextension 'at' sipxecs 'dot' info. Also, if you add an alias onto your sipXecs user extension that is equal to your e-mail alias, now users can phone you (with url dialing in their softphone) or email you at exactly the same address... voila! The cat is finally out of the bag... I've been working with Packt Publishing on a book on sipXecs 4.0 (that's why this blog has been a little sparse). The book is now available in pre-release (what Packt calls Raw) format. 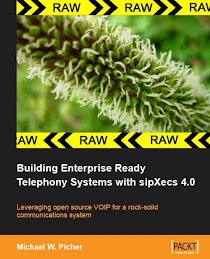 The book title is Building Enterprise Ready Telephony Systems with sipXecs 4.0. It is available for purchase/download by clicking on the above link. When Skype announced Skype for SIP beta applications were available we knew we had to apply. Fortunately we received our acceptance tonight and within minutes sipXbridge was making calls out the Skype for SIP network. Look for more on this when we release sipXecs 4.0 very soon. Skype could be a major connectivity player... it certainly has become a household term! Found a great on-line resource for diagnosing Voice Traffic Problems. VoIP Troubleshooter.com provides free online diagnostic tools and information for network managers. The site was originally created and sponsored by Telchemy Incorporated with Acterna joining as a sponsor in 2005. We're looking at putting sipXecs into a customer that already has a bunch of Aastra 5x series phones. Problem is that Aastra managed phone support isn't coming to sipXecs until version 4.0. However, it is possible to take the plugins from the development version of sipXecs (currently 3.11. Built a 3.11.9 box and grabbed aastra-phones.jar from the \usr\share\java\sipXecs\sipXconfig folder. Copied aastra-phones.jar to \usr\share\sipxpbx\lib folder on 3.10.3 box. Copied all files from http://sipxecs.sipfoundry.org/ViewVC/sipXecs/main/sipXconfig/plugins/aastra/etc/ to /etc/sipxpbx/aastra. Restarted sipxpbx services (service sipxpbx restart). The CentOS installed from the sipXecs 3.10.2 ISO did not have the drivers for this particular motherboard / network adapter so I was forced to do some digging. So others can benefit from my pain I documented my solution.. I downloaded kmod-r8169-2.3LK_NAPI-1.el5.i686.rpm from http://centos.toracat.org/ajb/CentOS-5/r8169 to a USB drive on my laptop. Plugged the USB drive into the server and waited for the 'up' message. After boot, login as root. Set the static IP address on the network card that was specified at sipXecs installation. Published another document today on configuring internal / external DNS for use with Session Border Controllers. It's got a bit of a sipXecs slant to it but should be useful for others looking for redundant and load balanced SBC setup help. YMMV with Asterisk & FreeSwitch installations and SRV based authentication methods... Most of the setups I have seen are A records pointing to the PBX. Alright, so you want to maintain one set of DNS servers for your organization and it's just easier for you to do it with Microsoft's DNS servers? I made public a document I wrote a couple years ago and published it on the sipX Wiki. Located here. After toiling for many hours I was finally able to get OpenSBC running properly on Vyatta. This solution builds a firewall that allows for Inbound SIP calling, Outbound SIP calling and far-end NAT traversal for remote users. Many thanks to Joegen, Eric and Raymond over on the OpenSBC site for their help and patience with me in getting this going.